Are iPads Invading the Enterprise? 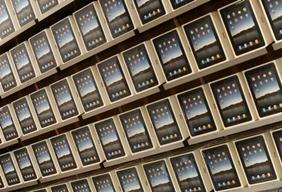 I recently read an article suggesting 92% of Fortune 500 companies are either testing or deploying iPads. According to Good Technology, though, 2 industries — Financial Services and High Technology — account for nearly 50% of the Top 100 iPad accounts. Interestingly, Retail, the industry I think could benefit the most from tablets, only accounts for 4.4%. Eric Lai at ZDNet has started to compile a list of iPad deployments. What is fascinating is the rapid adoption in Education – both K-12 and Higher Education. Are we beginning to reach a tipping point for tablets, or more specifically iPads, in the enterprise? Not even close. iPad usage in the enterprise today is mostly reserved for key executives and employees using their own tablets (mostly to access corporate email). While mobility and the use of iPads is all the rage today in HR and elsewhere, it should be viewed with the appropriate level of rationale of what and how it can be leveraged now and in the future. It isn’t a one-size-fits-all approach. I think that the use of iPads and mobile will be wide, but not yet deep. They are great for consuming and presenting information and so execs and mobile salespeople will be the big pushers.